Share the post "Gig review: NINEBARROW – South Hill Park, Bracknell, 3 May 2018"
South Hill Park is a lovely venue on the outskirts of Bracknell and tonight’s gig was in the cellar bar, perfect for a folk gig. Before Ninebarrow we had Edward Naismith who performed a short set and his vocals and lyrics recalled John Martyn, plus a little of Richard Thompson in the vocals at times. He didn’t have any CD’s available which was a shame as he impressed a few listeners this evening. 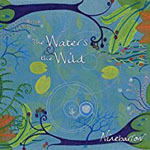 Ninebarrow are a duo consisting of Jon Whitley (vocals, mandola, harmonium , piano) and Jay LaBouchardiere (vocals, harmonium), who have been gaining rave reviews from the likes of Mark Radcliffe and they have just released their enjoyable new album ‘The Waters Wild’, which I highly recommend. Opening the first half of their set with ‘Weave Her A Garland’ you can tell from the off it is going to be a good gig, as both Jon and Jay are so in tune to each other’s vocals that seem to merge seamlessly into one at times throughout the course of the evening. Next up ‘Hour Of The Blackbird’ kept a spring like theme going, again the musicianship and singing were impressive. The scene setting before each song is a vital piece of their set, plus it allows both of them to ad lib and connect with their audience. ‘Siege’ is a fascinating tale of how Lady Banks managed to hold off in the besieged Corfe castle for twenty months during the English Civil War with just five soldiers! She only gave in to the Parliamentarians after being betrayed by one of her men. ‘Blood On The Hillside’ cleverly integrates the nursery rhyme about magpies into the chorus, although the Ninebarrow version is based on crows and they said this causes much debate at gigs when they perform it. ‘Prickle Eye Bush’ (covered by many artists including Led Zeppelin as ‘The Gallows Pole’) rounded off the first half of their set. Being from Dorset Ninebarrow like to celebrate the folk lore and history of the area and ‘Hwome’ starts off the second part of the evening. ‘Halsewell’ is a moving song recalling Dorset’s worst shipping disaster and both Jon and Jay really put their all into each song. The unaccompanied ‘Gamekeepers Lie Sleeping’ does remind me of Simon & Garfunkel, simply because both are spot on with the harmonies and the power of their singing is enough to grab the listener’s attention. ‘The Weeds’ rounds off the evening in style, an up-tempo tune although the subject matter about a man who loses everything by letting the love of his life slip through this fingers, is not as jolly! A superb night of folk music, which with Ninebarrow’s chilled/mellow sound has the ability to appeal beyond the folk world. The only downside was they were not playing at a larger room at South Hall Park as their music deserves a wider audience. One of the best folk gigs I have seen. This entry was posted in All Posts, GIG REVIEWS and tagged Edward Naismith, folk, gig, Jay LaBouchardiere, Jon Whitley, Led Zeppelin, live, mellow, melodic, Ninebarrow, review, Simon & Garfunkel, The Waters Wild, traditional. Bookmark the permalink.